The Living Field’s resident bread expert, Gill Banks, has been out and about, speaking to people on the merits of real bread, as part of The Crunch. At the first event, at the Maxwell Centre, Dundee, on 1 July 2016, Gill and Linda Nell contrasted some of the ancient grains grown in Scotland, such as emmer wheat and bere barley, with modern cereal varieties, and showed how fine, nutritious bread could be baked from bere and other corn. 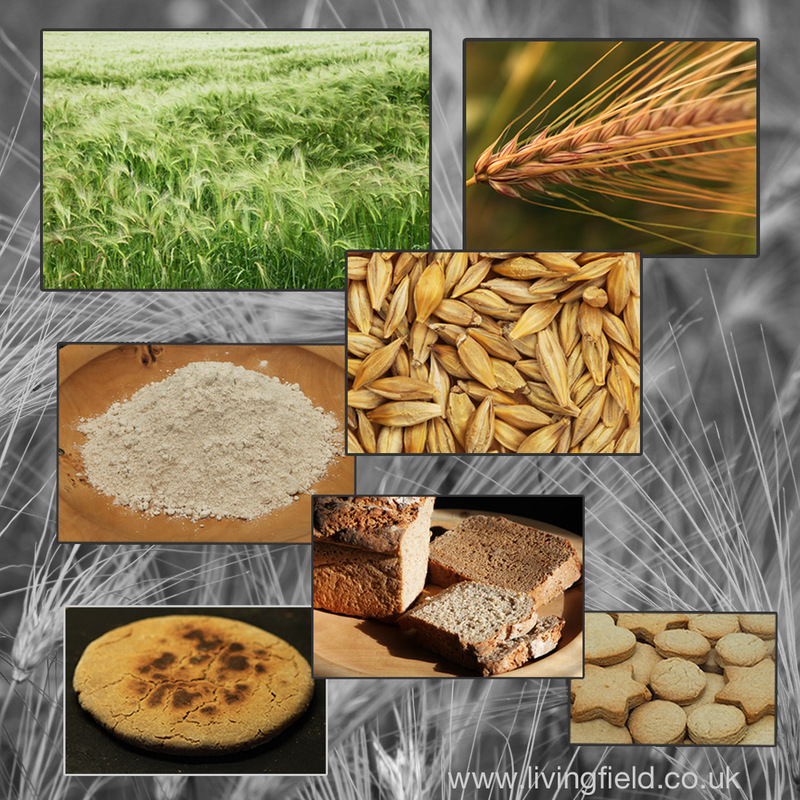 Here we look at the raw materials used to make bere bread ……. and also Gill’s experiments with something more exotic. Bere is an old form of barley, known by that name for at least a few hundred years. 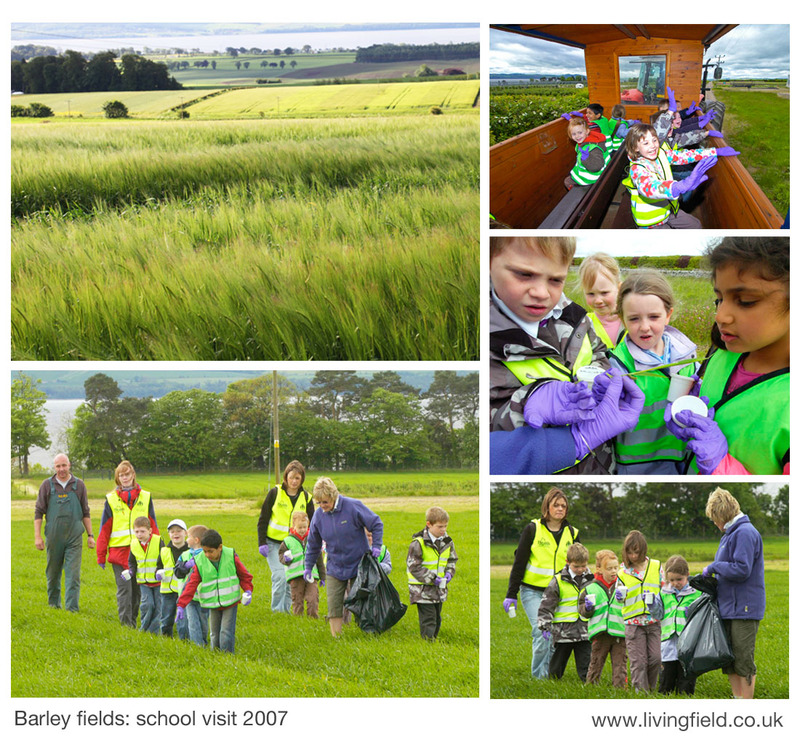 It is still grown in Orkney, from where the Living Field got its first stocks of bere seed. 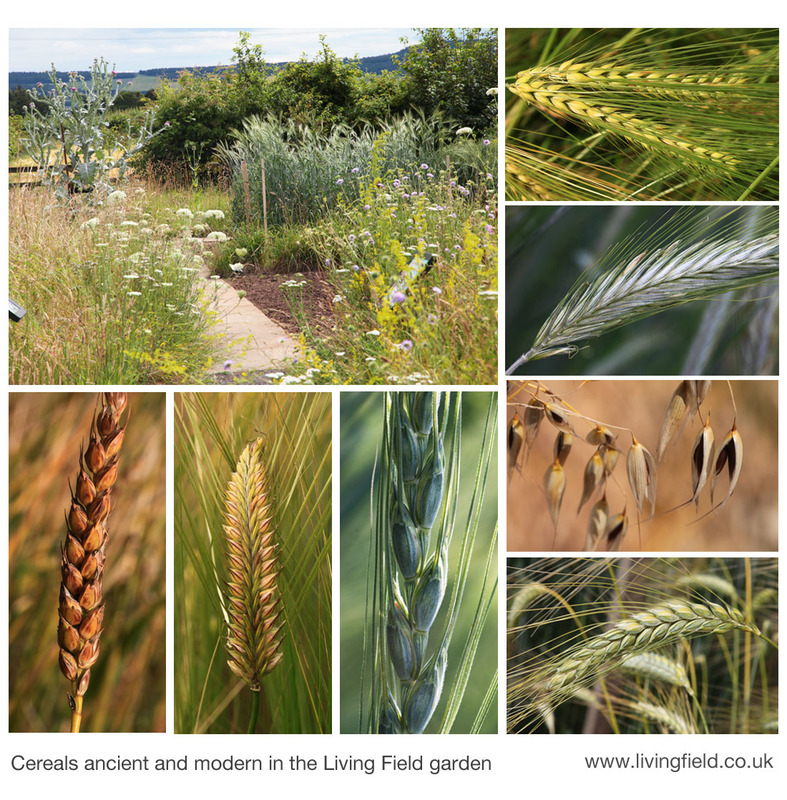 The crop is now grown in the Living Field garden each year. 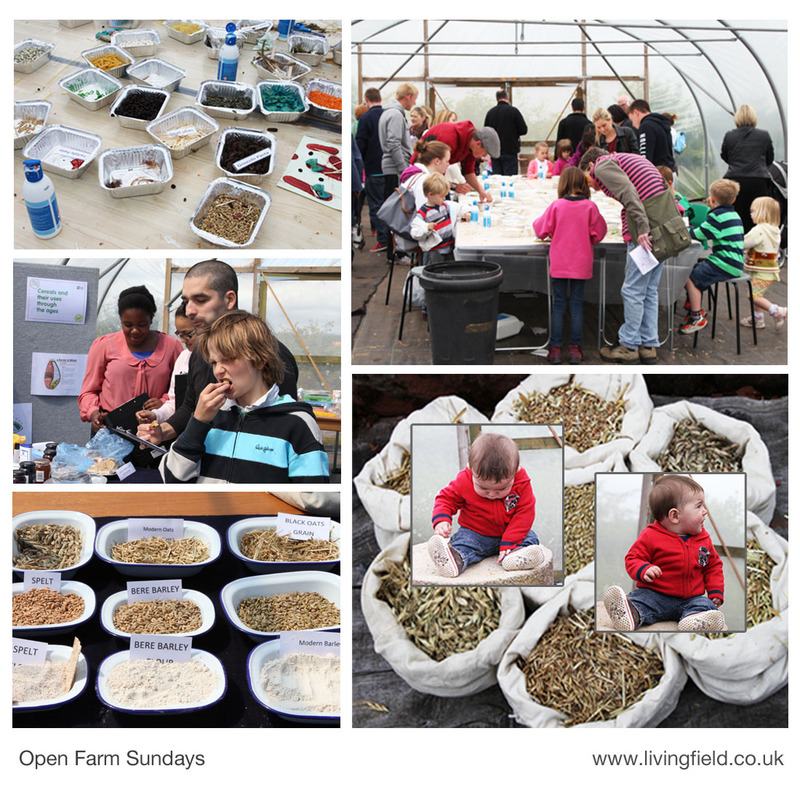 Seed is harvested and saved for next year’s crop. 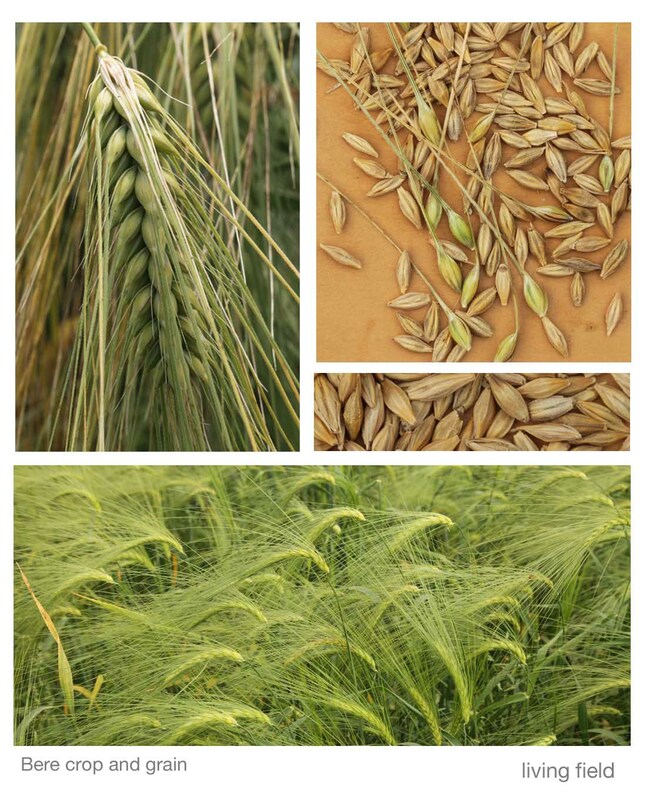 The image top right shows mature grain (light brown) harvested in a previous year, the awns removed; and for comparison, some green, unripe grain from this year’s crop, the awns still attached. The thin panel centre right is a closer view of the grain. To make meal or flour, the awns and outer protective coating of the grain have to be removed and then the grain is ground between stones. 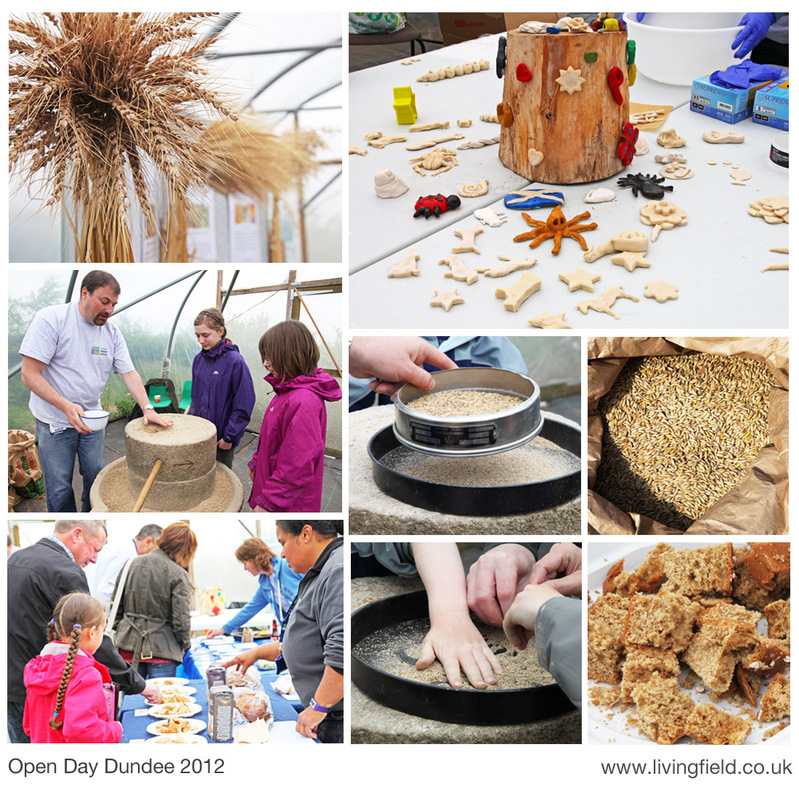 The Living Field can grind bere and other grains in its heavy rotary quern, but the meal Gill uses to make bread is bought from Barony Mills in Orkney. 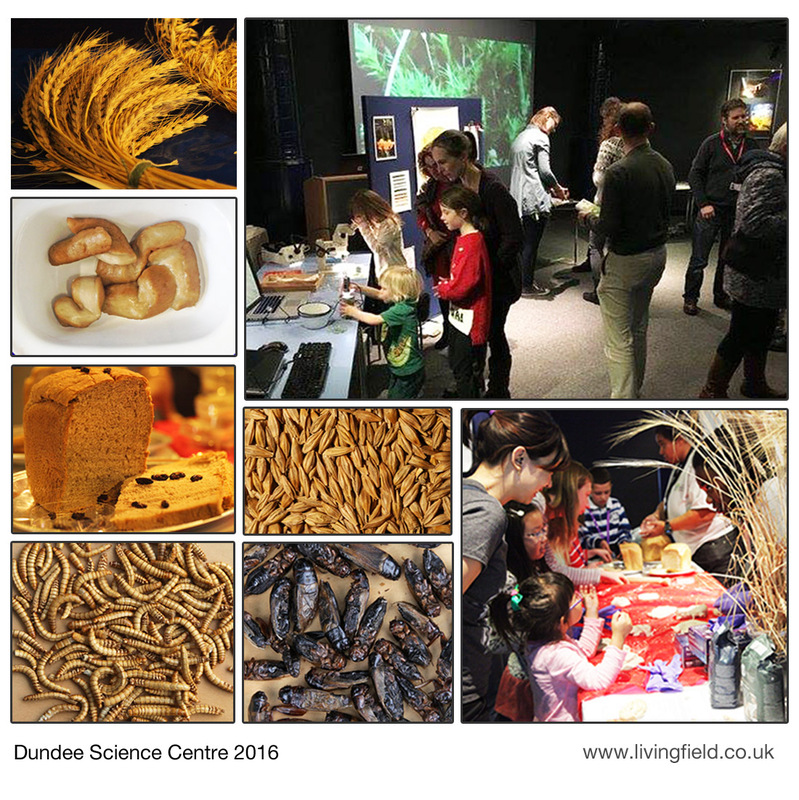 Following the first event in The Crunch, at the Maxwell Centre Dundee, Aisha Schofield from Dundee Science Centre suggested adding cricket flour to one of the bread recipes. Cricket flour is made from insects. 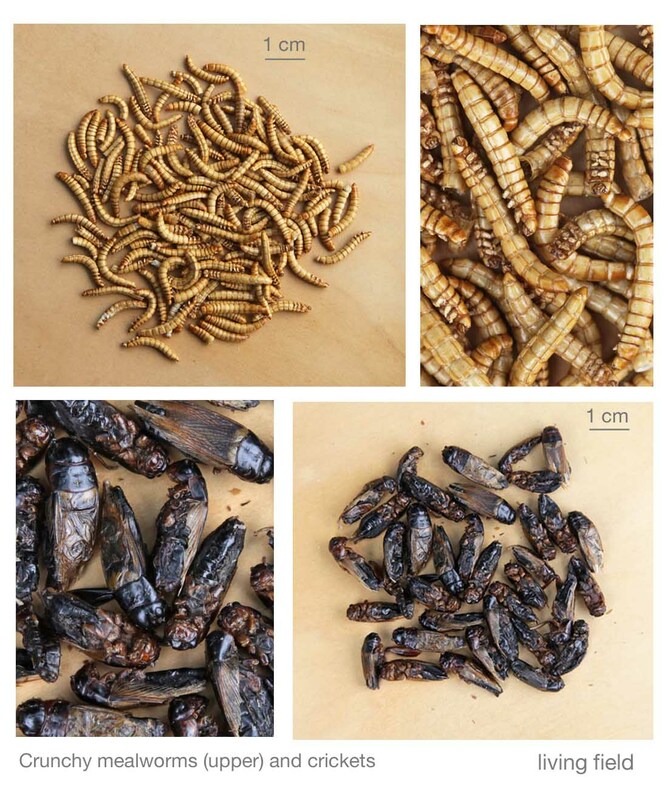 An experimental insect loaf was duly produced from Gill’s kitchen, using a meal mix that included ‘cricket flour’ from Cornish Edible Insects (images of their insect produce below). A tasting panel was quickly assembled. All agreed that the bread had the taste and texture of a wholemeal or ‘ancient grain’ loaf. Nice and fulsome with butter. There was no evidence (by sight, feel or taste) of insects in the bread – there were no wings sticking out of the slice and no unusual pincers or other crunchy bits. It was just tasty wholesome bread. A student from AgroParistech France, Benjamin Lepers, visited the Institute in 2015 as part of his project year. He studied diversity of wild plants in farmland and also the invertebrates (insects and spiders) living on different types of vegetation, such as the barley crop, grass patches and mixed dicot weed patches. He then went on to work for a few months at a new enterprise called Entomo Farm – Farming Insects for Animal Feed, which started in 2014, based in Bordeaux France. Their web page states that Entomo Farm has developed a self contained and transportable system for insect farming called the Entomo Box, which enables mass production of insect meal and insect oil anywhere with very few resources. Benjamin was intending to move on to Laos. He’ll find plenty of insects and exotic foods there. The Living Field would love to hear from him about his exploits. …. 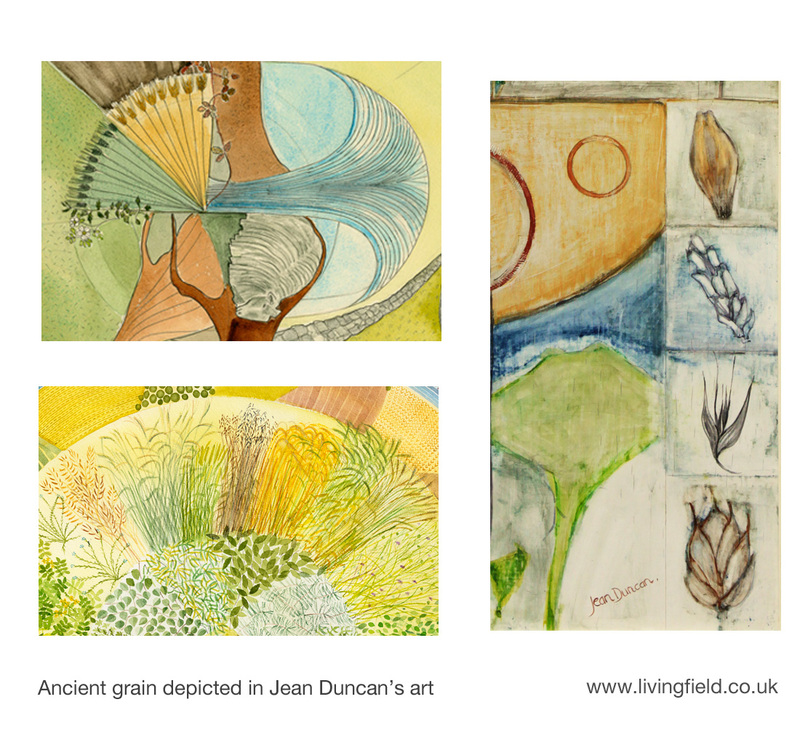 and more on Gill Banks’ experiments with bread to follow …. Barony Mills bere meal http://www.birsay.org.uk/baronymill.htm and see the following on the Living Field site Landrace 1 – bere and The bere line – rhymes with hairline. 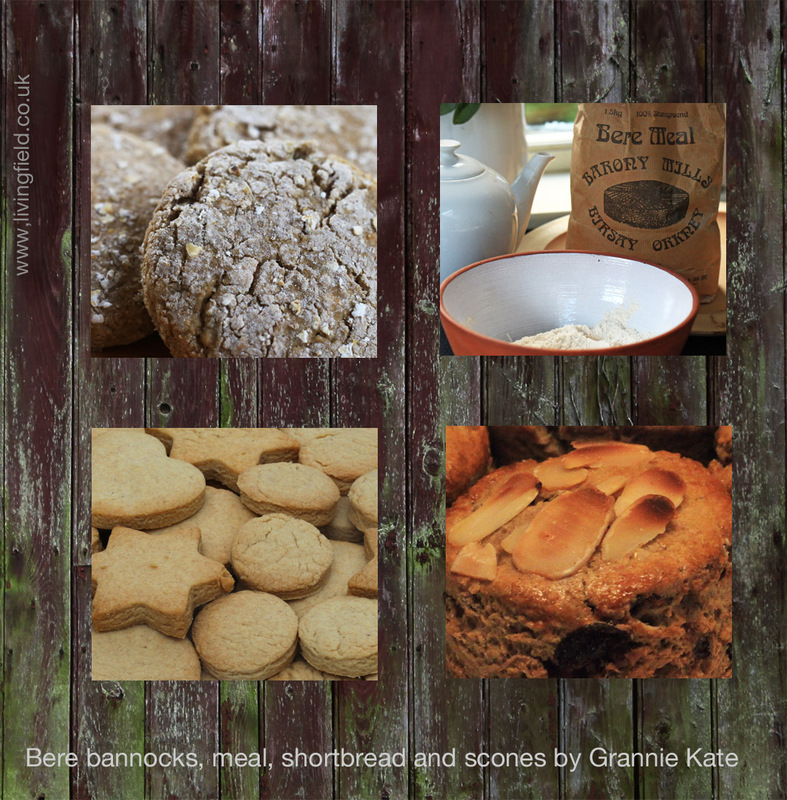 And for other bere recipes – Bere shortbread, Bere bannocks and Seeded oatcakes with bere meal. Entomo Farm Read more about the Entomo people and their aims and methods at: (link disabled, Jan 2017).